Let’s face it – when you go to the salon, you expect that your stylist will do a better job with your hair than you could do with a comb and pair of sewing scissors in front of your bathroom mirror. But how can you be sure? Here are few tips to help you recognize the cues, subtle and otherwise, that tell you this one’s a keeper. First of all, a good stylist is a good listener. He or she will not only listen to your description of the ‘do you dream about, they’ll also ask good questions to probe even deeper about you and your lifestyle. Your answers will help your stylist get a more complete picture both of what you want and what you can reasonably achieve at home on your own. Hand in hand with listening is honesty – if your idea for the perfect style won’t work given your hair’s characteristics or the demands of your lifestyle, a good stylist will tell you so, and make suggestions about alternatives that can give you the look but are better suited to your individual needs. 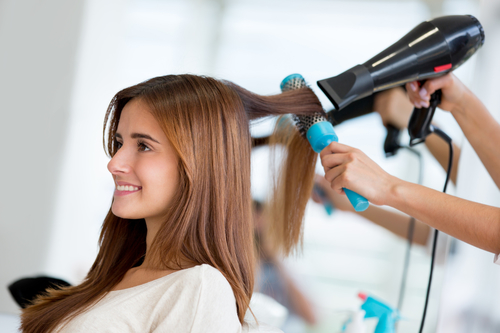 A great stylist is also up to date both with the latest trends and with the training and expertise to attain them. This means not only learning the techniques to create those breakthrough styles, but also the creativity to adapt them to their individual clients as needed. Hair styling is not a cookie cutter profession – you can’t just stamp the same style on every client. But being fluent with techniques and tools will let a real pro make each client a work of art by combining the style and the individual characteristics of the client simultaneously. Here at Salon D’Artiste our styling team is committed to staying at the top of their profession through ongoing training and professional development to help you look your best. For an appointment, you can reach us at 610.687.2020 or stop by the salon at Eagle Village Shops, 205 Lancaster Ave #2, Wayne, PA 19087. Want to make an appointment instantly? Use our app! Our app is available through the Apple Store, Google Play, or Amazon.